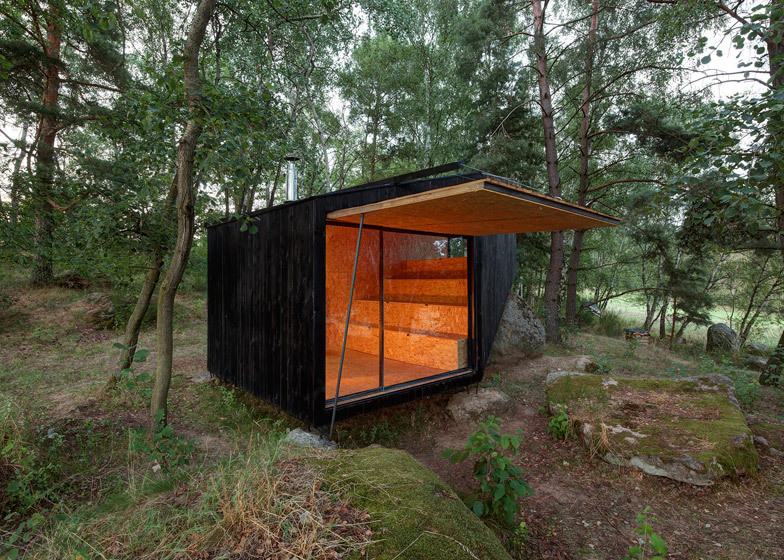 Charred timber clads this woodland hideaway that Czech studio Uhlik Architekti has built on top of a large boulder within a forest clearing in central Bohemia (+ slideshow). 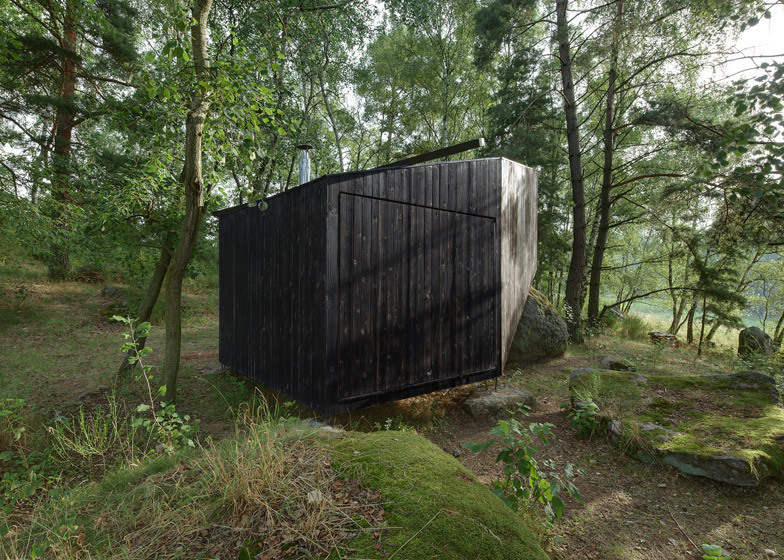 Uhlik Architekti designed the Forest Retreat for a client looking for a quiet escape from his hectic city lifestyle in Prague, choosing a rural site located in the region where he spent his childhood years. "He took us to a spot in the midst of fields, woods and meadows, full of strange boulders, to a remote and somewhat forgotten place. The magic landscape together with the client's aim won our hearts immediately," explained the Uhlik Architekti teams, which includes architects Petr Uhlik, Jan Sorm and Premysl Jurak. 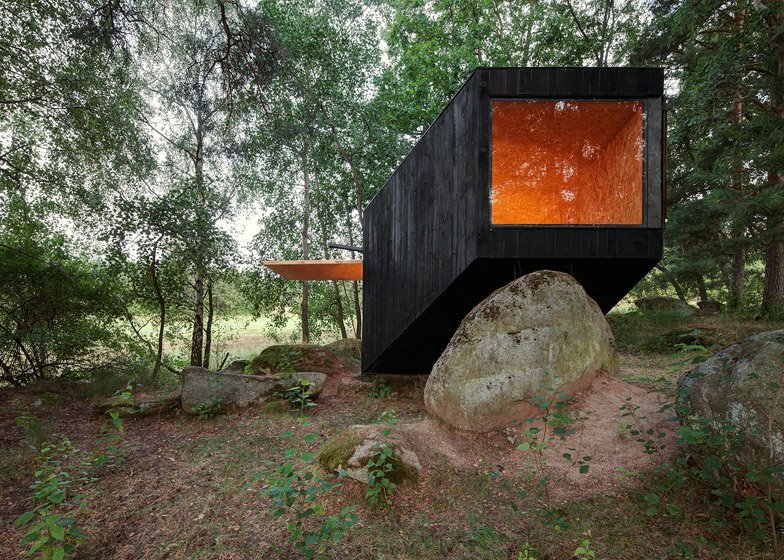 Rather than planning a structure that fits around the existing fauna, the architects came up with a concept for a boxy cabin that angles up to rest over one of the huge rocks, creating an elevated lookout. "We designed a compact enclosed volume – an object resting freely on boulders with a stern raised on a huge boulder," they explained. The team built the 16-square-metre structure themselves, working in collaboration with local craftsmen that included a carpenter and a blacksmith. "The building material was given: the base was wood from a nearby forest, for the rest we utilised local sources and skills of local craftsmen," they said. The exterior walls are clad with wood that has been charred to create a protective outer layer. 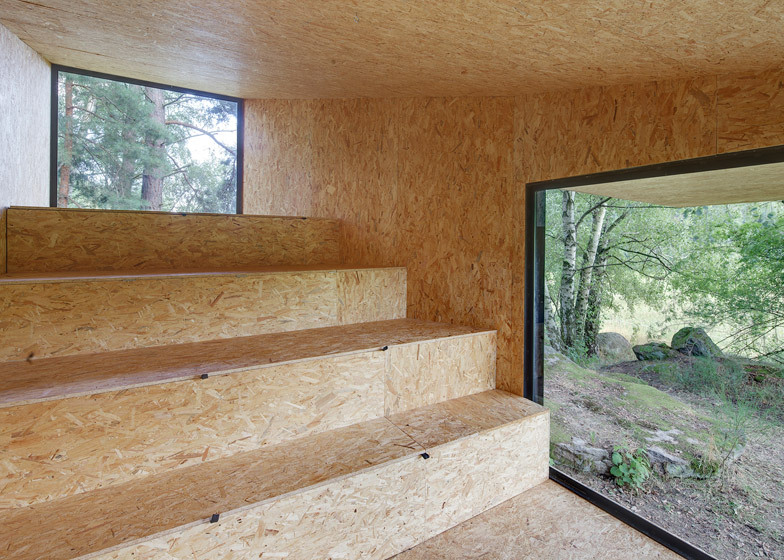 In contrast, the interior walls are lined with oriented strand board – an engineered wood particle board. "The wood for boards and joists was taken from fallen trees from the owner's land," said the architects. Traditional rabbet joints, which are made up of two stepped pieces, were used to fix different elements together. A layer of asphalt was also added over the roof to protect it from rainfall. Large square openings form the two ends of the cabin. The first sits level with the ground and functions as an entrance, revealed by operating a pulley and hand winch, while the second provides the elevated viewpoint that can be screened behind a large shutter. The space inside is divided up into two sections. One is a level surface that can be used as a dining area and the other is a series of steps that fold back and forth to create flexible seating areas, sleeping spaces and underfloor storage. "The multi-functional space is suitable not only for dwelling but also for smaller events, performances or just meditation," said the designers. Photography is by Jan Kudej. 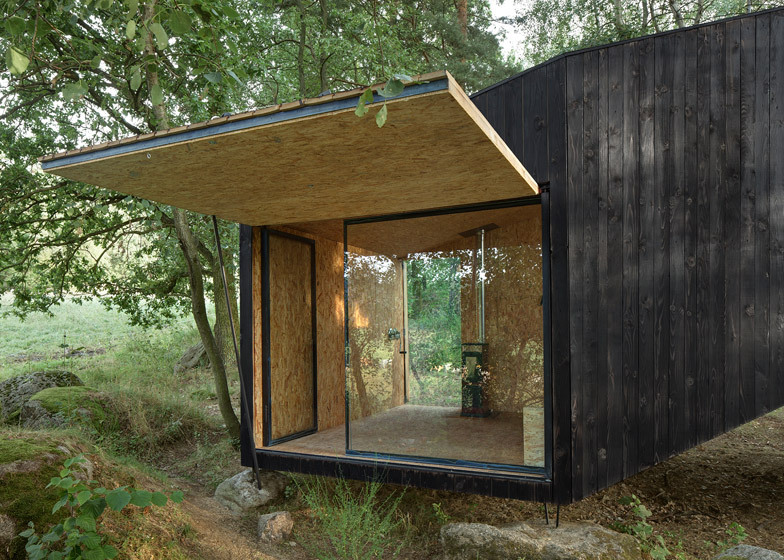 Our client contacted us with an idea to create a hideaway in the countryside where he could "hole up" and gather strength for his demanding work in Prague. We set off into an area between central and south Bohemia where he comes from and where he has loved going to since his childhood. He took us to a spot in the midst of fields, woods and meadows, full of strange boulders, to a remote and somewhat forgotten place. The magic landscape together with the client's aim won our hearts immediately. After a short hesitation, we decided to build the "forest retreat" (as we called it later) together by our own hands. The building material was given: the base was wood from a nearby forest, for the rest we utilised local sources and skills of local craftsmen. 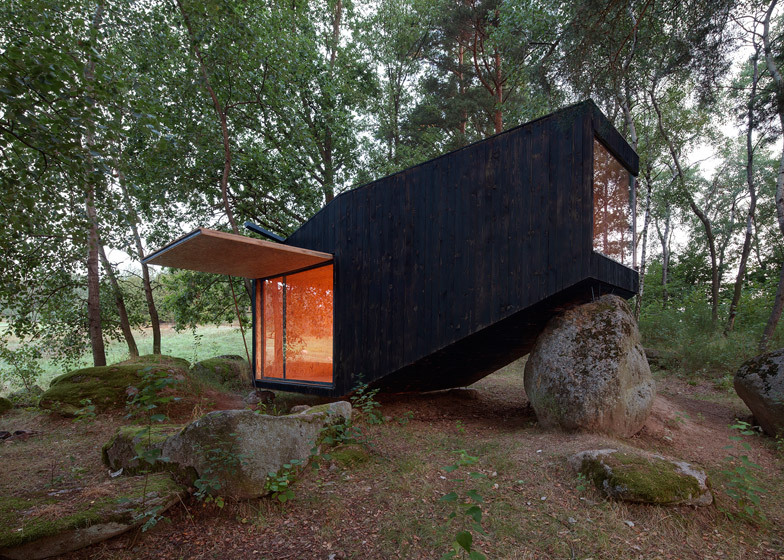 We designed a compact enclosed volume – an object resting freely on boulders with a stern raised on a huge boulder. 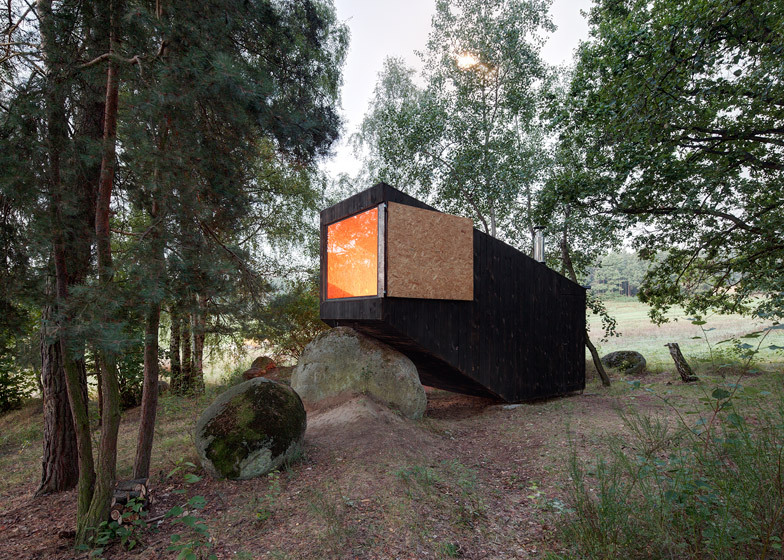 The enclosed black object made of charred wood contains one interconnected space with the dimensions of 3.1 metres x 5.8 metres. In the entering part is a flat platform with headroom just for a standing person; this part is opened by a large glassed-in surface offering the view. The remaining part of the object rises gradually towards another opening, facing the tree crowns. And there is a unique place for resting. Each step can be used as sleeping place. Under them, there is storage space; turning one of the benches over creates another double bed. The multi-functional space is suitable not only for dwelling but also for smaller events, performances or just meditation. Both glassed-in openings can be closed by big shutters, the bigger one by a pulley and a hand winch. The basic supporting framework of the forest retreat is a joist construction which emerged from the cooperation with local carpenters. The outside is covered with charred boards with rabbet joints. The wood for boards and joists was taken from fallen trees from the owner's land. 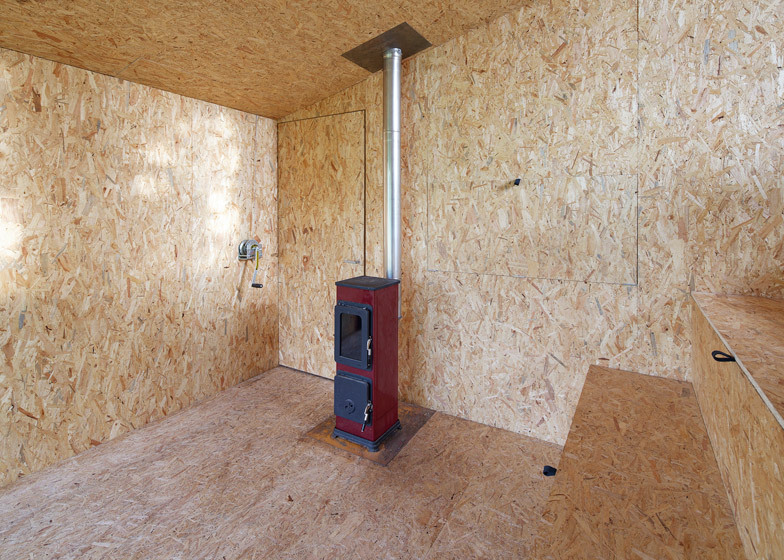 The inside of the construction is coated with OSB boards in order to reinforce it and also with respect to the low price. The roof is covered by two layers of asphalt belts. The drainage of roof is secured by a steel L profile, placed obliquely, which serves at the same time as a rail for attaching the idler pulley wheel. All steel components were prepared according to our documentation by a blacksmith from a nearby village. The building was assembled during a few extended weekends between the autumn 2012 and the spring 2013.